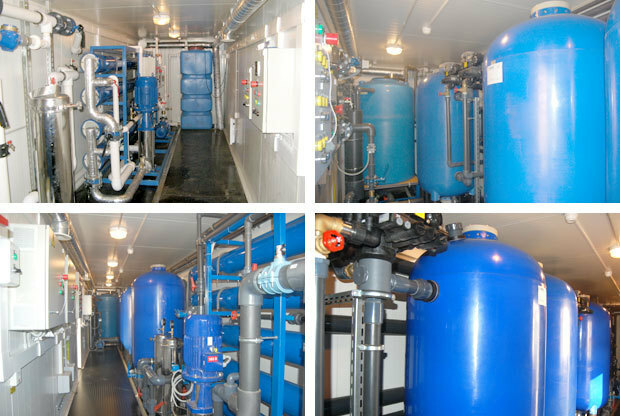 Modular and containerized water treatment plant (Water & Wastewater). 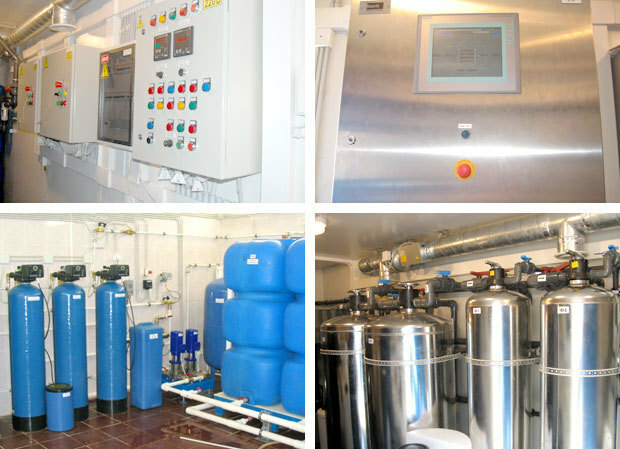 CJSC "Akvametosintez" develops and manufactures modular and containerized water treatment plants. in container design — series BVPU-K.
Purpose — cleaning of natural water from groundwater and surface water sources. — Enterprises of transport infrastructure. Functionality — water treatment plants are used for bleaching, refining, iron removal, demanganation, softening, desalination, decontamination, adjusting the mineral composition and disinfection of water to bring it up to regulatory requirements. Applied technology — the basis of the water treatment system laid mechanical, catalytic, ion exchange, sorption, flotation, electrochemical and membrane water treatment technology with the use of combination regimens decontamination. — Provide a clean highly contaminated freshwater and saline surface water and groundwater with color up to 400 degrees, iron and manganese content of up to 30 dm 3, hardness up to 20 mg-ekv./dm3 and salt content up to 30 g/dm3. — Let’s get The highly water with a conductivity of 0.05 mS / cm and the oxygen content of 0.02 dm 3. — Can be supplied with pre-fabricated frame-and-panel building, equipped with internal engineering systems. — Adapted for use in the field at temperatures from +50 to -60 oC. — Designed to accommodate both on concrete platforms, and on pile foundations in permafrost. — Can be equipped with self-contained power supply. — To be transported by any transport. Available in standard 20-bit or 40-foot containers, insulated sandwich panels from the inside. Plants are equipped with thermal stabilization and ventilation, lighting and internal ground loop, heating cables for connection to external utilities, and can also be fitted with alarms to opening and remote control. Minimum terms of the mounting of the construction of water treatment plants. Achieving quality assured water treatment at possible changes in the composition of source water. Low operating costs associated with the low power consumption systems, the use of filter media and membranes with long operation life and work settings in the automatic mode, without the involvement of a permanent staff. Block-modular implementation allows the upgrading with minimal cost, while increasing the volume of water consumption.